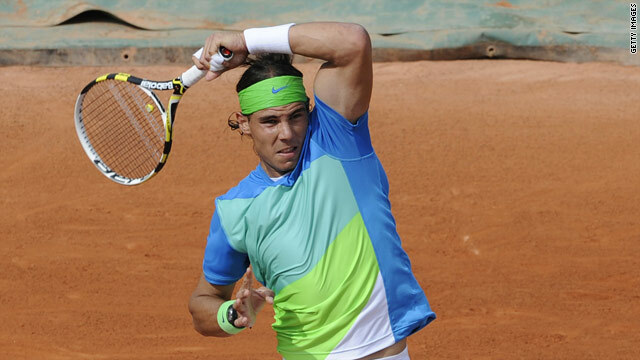 World number two Rafael Nadal is bidding to win the French Open for the fifth time. (CNN) -- Four-time champion Rafael Nadal cruised into the second round of the French Open with a 6-2 6-2 6-2 victory over French teenager Gianni Mina. Nadal, who is unbeaten on clay this season, saved seven break points as he overcame the world number 655 on the Suzanne Lenglen court in two hours, 23 minutes. "I think I played badly, but I won anyway, without problems, so that's always important and a positive thing," Nadal told reporters. "But I think I can do much, much better next round." Nadal suffered his only defeat at the French Open last year when he lost to Sweden's Robin Soderling as Roger Federer went on to claim the title. Meanwhile, American sixth seed Andy Roddick needed five sets to scrape past Jarkko Nieminen of Finland. Roddick, playing an ATP Tour match on clay for the first time this season, battled back from two sets to one down to win 6-2, 4-6, 4-6, 7-6 (7/4), 6-3. After more than three hours of play, Roddick broke in the fifth and final games of the final set to take victory. "There was a lot of ugliness out there today. But, you know, at the end of it, I get to play again," said Roddick on the tournament's official Web site. Elsewhere, seventh seeded Spaniard Fernando Verdasco beat Russia's Igor Kunitsyn 6-4 6-2 6-2 and ninth seed David Ferrer of Spain triumphed 6-1 6-3 6-1 over Frenchman David Guez. Former world number one Juan Carlos Ferrero of Spain beat Uruguay's Pablo Cuevas 6-4 6-3 6-1 and there were wins for Austrian 22nd seed Juergen Melzer and German 30th seed Philipp Kohlschreiber. Sam Querrey of the USA, the 18th seed, lost in four sets to his countryman Robby Ginepri. Former world number one Lleyton Hewitt of Australia had a routine 7-5 6-0 6-4 victory over Frenchman Jeremy Chardy.